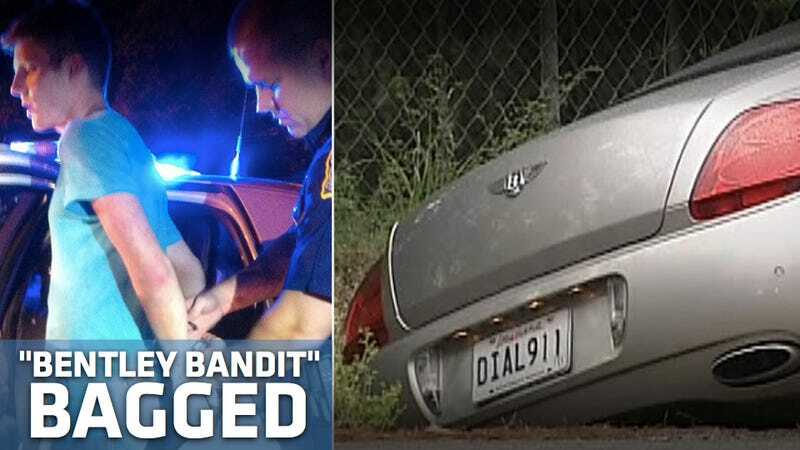 Fugitive car thief 22-year-old Justin Durbin's been conning his way from Mercedes to Mercedes in a string of clever heists that ended with his arrest in a stolen Bentley in Lake Charles, La. All without breaking a window or picking a lock. Durbin's MO was simple: Look normal, show up in a nice car, and then either take a test drive of the car you want to steal and never come back, or swap smart keys and come back later to steal the car. As far as police can tell, it started out in early June in Fishers, Ind., when the then "Benz Bandit" picked up a Mercedes at a local dealership using a smartkey snagged from another Benz dealer. He then traveled to Naperville, Ill., and swapped the car for a Mercedes SL550 he took for a test drive and never returned, before picking up a new 2011 GLK in St. Charles, Mo. His biggest heist would come in Naples, Fla., where he would drop the Benz and pick up a Bentley Continental GT and upgrade his status — becoming the "Bentley Bandit." When Durbin was contacted by Law Enforcement, he simply put his hands in the air and said, "it's me." U.S. Marshals and local police found numerous IDs and stolen license plates in the trunk of the car. In switching the plates he chose the boastful but ultimately stupid "DIAL 911" for the Bentley.